Known for popular attractions like The Great Smoky Mountain Railroad, Deep Creek tubing and hiking, and small town charm, Bryson City is a great spot for your next mountain escape. We offer a variety of vacation rental cabins and homes that are both close to town and provide easy access to outdoor activities. 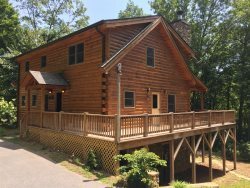 Our vacation rentals in Bryson City offer amazing views, beautifully designed interiors, and great amenities that make vacationing easy - such as fully equipped kitchens, hot tubs, and fireplaces. Fun for the whole family is easy in such a great destination, but having the perfect cabin in the woods will make sure your vacation is unforgettable.